Municipalities and School Districts Say They're Ready for 2019! Tuxedo Varsity Volleyball Team - Scholar Athletes! Dottie Audrey's Named #1 Bakery In Upstate New York! Red Apple Rest: Could Catskills casino mean new life for Route 17 restaurant? Where will our community be without a District? Have you worn a tuxedo? Village of Tuxedo Park residents and government officials celebrated the 30th anniversary of the village's listing on the National Register of Historic Places. Nearly 100 people gathered last Saturday in the gated community inside Chastelleux, the home of Gary Parr, an investment banker and chairman of the New York Philharmonic. Organizers recognized those most responsible for the village's listing, as well state, county, village and town officials for their past and current work. 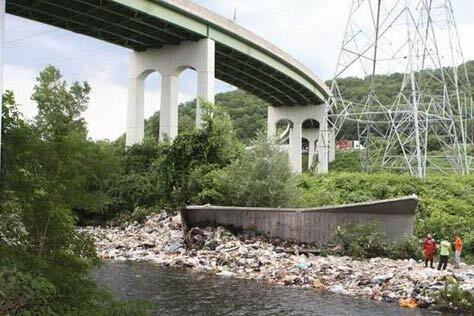 RAMAPO - A 44-year-old garbage truck driver died yesterday after his 18-wheeler veered off a New York State Thruway exit overpass, hit the highway below and plunged into the Ramapo River on the border of Suffern and Hillburn. Santos Ortiz, whose address was unavailable, was pronounced dead at the scene after his truck dropped 200 feet, landing on the west side of the river, authorities said. It fell from the Exit 15 overpass after leaving the northbound Thruway, and came to rest partly in the water. The 250-gallon fuel tank burst on impact, spewing as much as 100 gallons of diesel fuel into the river. 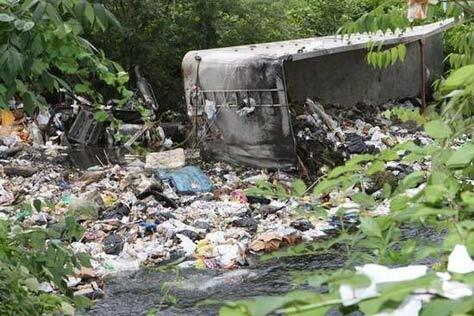 The truck was filled with garbage, which also spilled into the water, police said. "It was an environmental mess," said Ray Florida, executive director of Rockland Paramedic Services. "There was a ton of garbage." All wells in Suffern and Mahwah, N.J., were immediately shut down. Last night, Suffern drew on a reserve tank in the village that holds millions of gallons of water for emergencies, Police Chief Clarke Osborn said. He was unsure if the wells would be reopened by today. "This hopefully should not be a long-term problem," he said. "If we do run low, we can open up valves and receive water from United Water services in an emergency." A STAT Flight helicopter was dispatched shortly before 3 p.m. It was canceled en route because the driver was pronounced dead, Florida said. Additional paramedics were also called off. Dive teams from the Stony Point and Thiells fire departments were searching for additional bodies, though authorities said there likely weren't any. Large amounts of waste were found floating in the river near the truck. At least one lane of the Thruway was blocked for a short time as police and fire crews arrived. Traffic was flowing smoothly an hour after the crash. State police were investigating what caused Ortiz to swerve off the overpass. He suffered massive head injuries, Florida said. If you want to get to know Tuxedo Park trustee candidate Gary Pompan, check out his campaign video. But not on YouTube. "It's not appropriate," Pompan said of the Web site he said he never visits. So the video is posted only at www.tpfyi.com, a local site that's become a popular way for the village residents to keep up on community news. The video, which lasts about 3 minutes, has simple production values. Pompan stands in front of a leafy yard and talks about making the village an easier place to live by bringing clarity to a multitude of regulations governing building, development and renovations. In a place where people obsess over property values more than most, Pompan said, clarity of law will foster better neighborly relations. "It makes it much easier for people to go through different processes," he said. "When you're in a tiny community ... you're adjudicating each other ... . It's difficult when you have neighbors in that situation." Pompan is retiring soon as a partner with Ernst & Young, the auditing firm. He's one of three candidates for two seats, but will win because one of the candidates, Trustee Tinka Shaw, has dropped out of the race. The election is Tuesday. highest and best use would be to remain wilderness. would create new sources of pollution in this currently pristine area. treatment and then pumping it back upstream for discharge. TUXEDO — It will be at least several more years before anyone lives in Tuxedo Reserve but the huge development is stoking yet another brush fire in town. The latest controersy is over a plan to open a short stretch of road to all traffic rather than just public safety vehicles. The road doesn't exist yet, but the Tuxedo Reserve plan calls for it to be very close to Tuxedo Park, the Tuxedo Country Club Golf Course and some town neighborhoods where people live happily in isolation. So while officials see a new road to connect far-flung corners of town, others see rural roads choked with traffic. Officials say they're willing to give the plan a second look. "If the residents don't want the road open, then we won't open the road," Supervisor Peter Dolan said. "It's my job to listen to the residents." 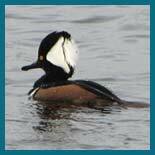 The Reserve property is bordered by Tuxedo Park to the north, Sloatsburg to the south, Route 17 on the east and County Route 72 on the west. If it ever gets built, Tuxedo Reserve, with 1,195 housing units and 30,000 square feet of retail space, would be the largest project in county history. Right now, there's no way to get from Route 17 to Route 72 without going through Sloatsburg. But a new road on the western edge of the Reserve could change that, making it easier for future residents of the Reserve to get out of the development and linking the neighborhoods of Eagle Valley, Maplebrook and Hamilton Estates with the town's commercial district. Town officials say the road would build a sense of community in town and help local businesses because residents would no longer have to drive past a deli in Sloatsburg to get to the deli in Tuxedo. But Tuxedo Park residents complain that it would lead to a lot more traffic along South Gate Road - one of two entrances into the Park. The road also runs beside the 9th hole of the golf course. People from the village and the club have been complaining about the town's plan for months, citing a deal between the club and Tuxedo Reserve to limit the road to emergency vehicles. But Dolan said he doesn't care about that deal. "Should it be the town's responsibility to make the decisions," he asked, "or should it be the country club's?" A meeting dedicated to the issue will be held at the Eagle Valley Firehouse March 23. Nonresidents who wish to enter Tuxedo Park must get permission and state their reason for entering. TUXEDO PARK — A resident whose building project has been stymied has filed a federal lawsuit demanding that the village remove its gates and stop monitoring who uses its public roads. "No community can gate out the Constitution," said Dennis Lynch, the Nyack lawyer who filed the suit. 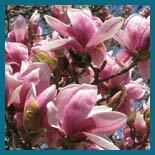 "The Village of Tuxedo Park is still part of America the last time I looked. They're required to allow people in and out." The plaintiffs in the suit are Donald Hanson, a resident, and Tony O'Neill, a contractor. The suit alleges that Tuxedo Park officials have prevented construction on Hanson's property by, among other things, ordering guards to stop O'Neill from entering the village. Tuxedo Park was incorporated in 1952, but retained security gates at its two entrances. Anyone who is not a resident must state a reason for entering the village and cannot enter without permission. The village also has a law proscribing photography of any sort from its public roads, contrary to a right that's been well established by courts and lawmakers. "No village is an island and no village can deny people's civil rights to enter and exit," Lynch said. "It's not just Tony O'Neill, it's anyone coming in. Civil rights don't depend if you're to the manor born." The suit asks for $25 million for the plaintiffs and a declaration that the village's laws are unconstitutional. Tuxedo Mayor Houston Stebbins did not return a call seeking comment, but the village might be trying to pre-empt any possibility of its laws coming under judicial scrutiny. It has called a special meeting Thursday to discuss Hanson's construction project. Something similar happened the last time Lynch sued the village over its entry requirements. In 2005, Lynch filed suit on behalf of Stephanie and Brian Costello, one of a handful of homeowners to live inside the gates but not within village boundaries. The Costellos challenged the village entry policy as part of their suit over sewer and water service. The suit was settled out of court. Lynch said the latest suit will go forward even if the village decides to allow O'Neill to finish work on Hanson's property. "The civil right to property is distinct from the civil right to travel," he said. Marc Wouters is at left. from a failed loan agreement. the freedom to seek alternative financing. implemented immediately," the filing says. of retail space and several hundred acres of protected open space. seems all but out of the question. lien to find other financing. Town of Newburgh – Police officers from the Town of Montgomery and the Village of Tuxedo Park were among four people arrested Tuesday and Wednesday, after an investigation by the Orange County District Attorney’s office, Wal-Mart security and the State Dept. of Taxation and Finance uncovered an alleged theft scam at two local Wal-Marts. Clifford M. Barber III, 41, of Walden, and Kevin Burchell, 26, of Montgomery were both arrested Tuesday, along with a Wal-mart employee, Bryan Dunn, 36, of Maybrook. Those arrests followed the execution of seven search warrants, with state and local police fanning out across the towns of Montgomery, Newburgh and New Windsor, as well as locations in Ulster County. Barber is a part-time Town of Montgomery police officer. Burchell is a Tuxedo Park police officer. A fourth suspect, Laquionus “Q” Pressley, 29 of Newburgh, surrendered to police Wednesday morning. All four are accused of participating in the thefts of hundreds of thousands of dollars in merchandise from the Wal-Mart on Union Avenue in the Town of Newburgh and Route 211E in the Town of Wallkill between April 2006 and April 2008. Some of the alleged thefts were captured on Wal-Mart’s internal store cameras, according to a complaint against Barber. Barber was arraigned Tuesday night before Newburgh Town Justice Richard Clarino and released on his own recognizance pending an appearance in Town Court on Nov. 17. He’s charged with third-degree grand larceny, first degree offering a false instrument for filing, and filing a false personal income tax return, all felonies. He was also suspended from the Town of Montgomery police dept, where he has worked since 2003, said Police Chief Arnold Amthor. Dunn and Burchell, also were released on their own recognizance. Pressley arraignment is pending Wednesday morning. Amthor said town police assisted in the investigation, and that the department was "both disturbed and saddened" by the allegations against Barber. "We are confident in the investigation that was conducted, and confident, as well, that justice will be served in this case," Amthor said in a prepared statement. Burchell has worked full-time in Tuxedo Park since May of this year. More details will appear in tomorrow’s edition of the Times Herald-Record. 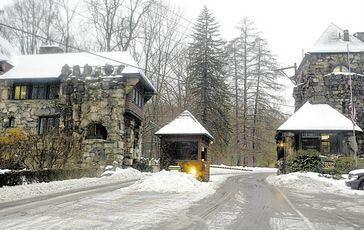 In Sloatsburg, small has been good. But with large-scale residential developments looming all around and the western Ramapo sewer project approaching, political leaders will have to hold tight to keep the burg rural. Sloatsburg Mayor Carl Wright, a Democrat who also won the Republican line during a primary, is challenged by political newcomer Marino Fontana on the Open Government Party of Sloatsburg line. Laurie Smyla, an environmental activist and former village recycling coordinator, is vying in a three-way race for the trustee seats being defended by incumbent Republican Barbara Berntsen and Democrat J. Mark Reimer. Berntsen is also on the Democratic line and Reimer on the Republican; Smyla holds the Open Government Party of Sloatsburg line. All terms are four years. Trustees are paid $4,500 a year; the mayor earns $12,000. For mayor, we endorse the return of Wright, whose breadth of experience gives him a clear understanding of issues faced by the village, especially in the current economic climate. For the two trustee posts we recommend Reimer and Smyla. Voting takes place Nov. 4. Echoing all candidates' hopes to keep the burg as rural as possible as development crops up around them, Wright told the Editorial Board, "Our community is one of family, friends and neighbors." There's little room for development within the village. A 12-acre space downtown is now being considered for a grocery store, some small businesses and housing above. Fontana, 51, said he wasn't "100 percent in support of a large development there," citing traffic on Route 17. A grocery store within the village is needed, others said. The village's Master Plan of Development must be followed and kept fresh, especially as a sewer system makes development easier and more attractive, the candidates agreed. The village sits atop an aquifer that supplies 20 percent of Rockland's water, so the concern over failing septic systems is great. Reimer exhibited intricate understanding of these circumstances - he pointed out that a lot can be learned from Hillburn's experience with installing sewers, a difficult and invasive process. One lesson learned: Reimer noted that the village board has ensured Rockland Sewer District No. 1 will repave whole roads, "shoulder to shoulder," instead of patches, after laying sewer pipe, a boon to the village. But it is the development outside the village that is of greatest concern. Just over the border in Orange County, the 1,100-unit Tuxedo Reserve condominium project threatens to clog Route 17. Sloatsburg had no voice in permitting the development, but Reimer pointed out that the village board nonetheless won payments over 10 years from builders of Tuxedo Reserve to go toward emergency services, the library and commuter parking. Just south of Sloatsburg, in unincorporated Ramapo, the 263-unit Ramapo Hills condo project is proposed. Reimer said the village will push for town funds to add a fire truck. Smyla noted that no one from western Ramapo sits on the town's Planning Board, yet developments like Ramapo Hills impact villagers. "We need a dialogue with the municipalities around us." We believe Smyla's environmental background and wider view of the village will serve residents well. The 59-year-old Berntsen's focus on the commercial downtown seems too limited during this transitional period. The village must also face the economic fallout that will hit every layer of government. Wright noted that expenses are already up, including the purchase of salt and sand for winter. "Energy costs have skyrocketed." He wants to examine all utility and transportation uses, even minimizing the Department of Public Works' trips to Village Hall. "A little nickel here, a little nickel there." TUXEDO - An agreement has been reached between the Tuxedo and Greenwood Lake school districts, putting the first of what officials hope is an eventual five-year pact in place to send Greenwood Lake students to George F. Baker High School in Tuxedo. Officials approved a one-year agreement, retroactive to July 1 of this year, which officially allows Greenwood Lake to send its high students to the Tuxedo school, as has been the case for years. But state law requires Greenwood Lake residents to give their approval for the second through fifth years of the proposed contact. The vote will take place Wednesday, Dec. 10, from 11 a.m. to 9 p.m. at the Greenwood Lake Elementary School.“ We’re delighted to be able to have accomplished this,” said Harvey Hillburgh, Greenwood Lake School District interim superintendent. “We’re hoping the voters support the five-year agreement. It’s time to move forward and concentrate on the education of our students. I think Baker is an excellent high school.” Joseph Zanetti, Tuxedo School District superintendent, said negotiations allowed people to determine “what’s important and what they can live with while giving each other a clearer understanding” of what each district’s needs. “It came down to facing the kids and what their needs are and the need to get some stability (in both districts) and redirect our efforts to the education side,” Zanetti added. “The discussions were nothing but positive.”Under the contract for the 2008-2009 year, Greenwood Lake would pay $12,800 per student for “general education;” $25,600 per special education student; $6,400 per CTEC student; and $12,800 per vocational special education student. Future changes in tuition, both superintendents said, would be based on the actual average percentage of increase or decrease of expenditures for both districts from one year to the next. “I believe those will be very modest increases,” said Hillburgh. “We’re all working to keep our expenditures down.”Hillburgh also stressed that as part of the agreement, Tuxedo would give back to Greenwood Lake $250 per student, part of the state aid it receives, offsetting the tuition amount and making the net increase per student only $50. “That’s helpful,” Hillburgh added. “Looking at everything, both boards felt it was fair. We are looking forward to a productive future together.” Like Hillburgh, Zanetti was equally hopeful Greenwood Lake voters would approve the four-year component to the contract. “I’m quite optimistic based on both boards’ unanimous approval of the memorandum of agreement,” he said. “It should signal to the community that the agreement is something both boards feel is fair.” The agreement doesn’t address the longstanding concerns of if Greenwood Lake students should go to Tuxedo or elsewhere - including building a new high school within Greenwood Lake - for their high school education. That decision, while still years away, could eliminate 80 percent of students at Baker High School and has been the subject of touchy conversation over the years. Early last summer, the state Education Department agreed to entertain the district’s request for a high school program if it can prove that creating one will be financially beneficial to the taxpayers. Greenwood Lake sends 320 ninth through 12th graders to Tuxedo. A letter from Charles Szuberla, executive director of school operations and management services for the New York state Education Department, said the district must continue to look for another partner district if Tuxedo is too expensive. Last year, voters in the Warwick Valley School District overwhelmingly voted no on a plan that would have brought the 320 students to Warwick. In 2005, the Chester School District turned down a proposal to take the Greenwood Lake high school students into Chester Academy when the public outcry put an end to the consideration even before any study was done. The Monroe-Woodbury School District also declined to take the students. But the first step in figuring out that process could possibly be underway if the long-term contract is put in place. TUXEDO PARK — Days before the village election, an influential resident has moved to block former Mayor David McFadden's bid to win a trustee seat. In a letter sent to village residents, Peter Regna outlined the results of a background check conducted by a former FBI agent on McFadden's architectural staffing firm. 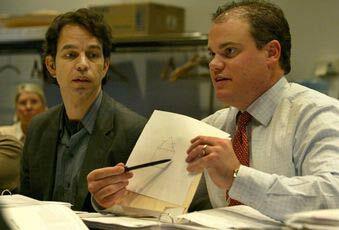 The letter lists two dozen liens and judgments against Consulting for Architects, the firm McFadden started in 1984. "Anyone who has a small company that has that much embroiling litigation is not fit for public office," Regna said in an interview. "If a guy can't run his business better than that I worry about how he would run the village." McFadden is one of four candidates vying for two seats in Tuesday's election. The others are appointed incumbent Charlotte Worthy, Jim Hays and Robert Silvay. Regna said he performed cursory Internet searches on the other candidates but McFadden was the only one who merited further investigation. "Things did come up," he said of the others, "but nothing that would influence an election." McFadden accuses Regna of trying to strong-arm him out of the race. "The issue is we're a very small community and this type of behavior is very polarizing," he said. "It is not neighborly. The fact he's investigating people who are running for trustee is a scary thing." The animosity between Regna, a Planning Board member, and McFadden dates back at least to 2005, when McFadden made Planning Board reform a major plank of his administration, including a law setting term limits, though Regna was grandfathered and kept his seat. In 2006, Regna and village resident Jake Lindsay filed a defamation lawsuit against McFadden for comments he made suggesting Lindsay was getting preferential treatment from the Planning Board. The suit was settled when McFadden apologized. Regna's letter goes after McFadden's claims about his business acumen. It lists 24 items from 2003 to 2006, including tax liens, with one greater than $100,000; and multiple court judgments won by creditors. McFadden said the liens and judgments stem from the economic downturn after 9/11, when he had to close his offices in Boston and Chicago, and said he's "worked out every single one of the liens" and "paid back all my creditors in full." Friday, he produced a letter from his attorney that rebuts each point in Regna's letter and says McFadden "was able to successfully resolve and satisfy each dispute and disagreement" through "effective leadership and a strong business sense." This Week’s Stupid Things, or Let’s Stop Doing Them. I’m not looking for a new job, but i get journalism job postings delivered to my Google Reader and I scan them just about every day because, one, that’s what one does in my business, and two, I got laid off last summer and if I hadn’t had something else on the skillet already, that could’ve been very bad for me. I just came across this post, which resembles listings I’ve seen about 500 times in the last few months and to me, exemplifies many things wrong with papers today, especially small and mid-sized papers, including mine, the Fightin’ Times Herald-Record. If variety is the spice of life, then we have an opportunity for you. Kansas Media One is searching for a full-time reporter who can produce quality stories for a daily community newspaper that serves Leavenworth County. For the daily Leavenworth Times newspaper, the reporter will focus primarily on Leavenworth County, but will also report on news events around the city of Leavenworth. There also will be opportunities to produce feature packages. Applicants should have reporting experience and a background in journalism, English or other related fields. Knowledge or experience with pagination layout is considered an attribute, but is not necessary. In other words, come do everything and never be any more than mediocre at any of it! The bias against specialization in media companies is self-defeating and then some. It’s fostered newsrooms full of haggard reporters who aren’t nearly the stars they could be because they’re spread so thin. And it’s a huge factor in newspapers’ dwindling readership and influence because reporters are not given the chance to become experts in the communities they cover, or experts in education policy, or experts in government finance, or really great writers or videographers or whatever. What a fellow journalists calls F.U. skills. He’s talking in the context of the job market, but F.U. skills attract readers. Overwork and unreasonable expectations = stenography. Stenography of some sorts (the sentencing of the principal child molester, the city council vote, etc.) is very important, but we need to stop doing so much of it. It’s important but it’s also about the easiest thing a reporter does, and there are people willing to do it for us for free. Papers aren’t so bad on figuring out what new stuff to do. They’re awful at figuring out what to cut. So here’s my three-step cure to ease workloads and mental anguish while encouraging innovation and the use of important new skills like video, blogging, multimedia-ing in general. 1. It’s past time to understand 99 percent of car accidents, fires and arrests are the mundane details of life and people really don’t care, despite what page views say. In almost every instance these stories are cupcakes, eaten because they’re there, but wouldn’t be missed if they were not. Ever hear anyone crave a cupcake? This applies especially in non-competitive markets. Don’t confuse this point with me saying get rid fo cop reporters. Our cop reporter, Oliver Mackson, is one of our best reporters, and he doesn’t do the kind of stories I’m talking about. The rest of us do them endlessly. We all know cops love talking to the media when they have a big bust to report. If there’s been a murder, we’re gonna know already. As for traffic tie-ups, who better to report these than people caught in them? It’s worked for radio stations for decades. Why does anyone think a reporter sitting at a desk will do a better job of reporting them? My paper already has a place for readers to upload bad potholes, so why not let them send traffic advisories, too? There will be times actual reporters are needed on these issues, but not nearly often enough to have a dedicated shift five days a week. It’s tantamount to flushing 10 hours of reporter time that could be spent talking to sources in cafes, or editing a cool video project, or writing a really strong narrative piece, or, in my case, playing with a spreadsheet. 3. We need to spend a lot less time at meetings. I spent seven hours at a meeting in Tuxedo Park last night. Got home at 2 a.m. had to be at work at 7. Got three hours of sleep. You can imagine how productive I was today (quite, surprisingly, but my bounce-back ability doesn’t disprove the point). I went because there were important items on the agenda and the officials in the village go out of their way to not talk to me, so sometimes I need to show up just to hear what they have to say on a particular topic. But last night I did something I’ve done way too much of in my young career - I stayed at a meeting just because I thought I was supposed to (and also out of pride, especially when 1:30 arrived and i was the only one there). But I didn’t have to, for two important reasons. A.) Almost every public meeting is a show trial. Real decisions get made in back rooms through back channels, no matter how much integrity sits on a particular board, council, whatever. Show me an official who says he didn’t know how he would vote when he got to a meeting and I’ll show you a liar. That’s like me saying I don’t have opinions on the stories I cover. It’s worth going to some meetings to meet the other people who go, to get a sense of the dynamics of the governing body, to build good will, to learn, etc. But in many way there the least important place to have loafers on the ground. So, last night, I spent seven hours being a stenographer instead of four hours reporting and three hours sleeping. And it was even more stupid because Tuxedo Park is the perfect example of letting regular folk do our grunt work. B. )The world is full of citizen journalists. The people who write for those sites are hugely important to other people in Tuxedo Park and me. I barely bother with the official Web site because these sites have much more of what I want to know. I get reports of every municipal meeting, architectural review board included, updates on community events, births and deaths and some really helpful political commentary. In other words, I know a lot about Tuxedo Park without ever leaving my desk. I’ve gotten to know the people on the sites and lot of other people in the village, so I know many of their biases and where they’re coming from on various issues. And because I have put in my time at some of the same meetings, I know I can trust the reporting. And when the time comes, I can step in with coverage in the paper, not as the all knowing sage, but as the disinterested party who’s made the effort to study the issues from many sides, learn the back story and provide the context of what’s really going on. The market term is adding value. There are lots of smart people in the world who are interested in citizen journalism and just as capable as reporters of covering a meeting or a traffic jam. Building relationships with these people is the solution to free up reporters to do the substantive work of real value to the people who don’t have time and/or expertise to do it. Mayor Houston Stebbins narrowly unseated former Mayor David McFadden a year ago, but those guys are still at it, as are their supporters. The latest point of contention is how seriously village residents should take McFadden's report that his home was recently ransacked and burglarized. On April 1, McFadden sent an e-mail to his neighbors warning them of "several home burglaries ... ranging in the thousands of dollars in value." Not true, Stebbins countered a day later in a letter sent to residents. Based on the available evidence, he wrote, there were only two "alleged" burglaries in six months and they don't appear to be connected. The mayor then touted the hard work of the police department and the recent authorization to hire two more full-time officers. Guess who opposed that move? McFadden, who now says the mayor is using the burglary to secure support for that decision. "The Mayor should not use my hardship to score himself political points — in this case to hire extra police," McFadden wrote on his Web site, especially when Stebbins contends there's no threat to village residents. Meanwhile, the people at another village site that's generally supportive of Stebbins, are with him on this issue. "First and most importantly, we are sorry for David and Robin's loss," says a post on the site. "However it is still not appropriate to spread misleading information from an unofficial source that causes undue panic among residents." The moon was full and obscured by the Earth's shadow last Wednesday night, which may explain the snowy and cloudy logic that Tuxedo Park Trustee Chris Hansen used to avoid admitting a mistake. First, a little history. In January, the trustees held unofficial votes on several parts of a new license for the Wee Wah Beach Club, one of which had to do with changing the way the club's board members are elected by Park residents and people who live in the part of Tuxedo known as the Hamlet. Hansen voted for the change, but in the one official vote of the night, he vetoed the license agreement because he wanted it to last for one year, not two. But last week, when a Tuxedo Park resident objected to the plan because she feels the new arrangement — supported also by Trustees Tinka Shaw and Larry Darby — disenfranchises Park residents, Hansen claimed he didn't support it because he voted against the entire package. He further claimed that Mayor Houston Stebbins and Trustee Charlotte Worthy, who voted against the new voting method, support it because they ultimately voted to approve the new license agreement. After insisting that his position on the license agreement be corrected "for the record," Hansen repeatedly urged his colleagues to just "move on." But the mayor didn't want to move on because if Hansen really was opposed to the new voting arrangement — as he claimed several times — it meant the new arrangement wouldn't have to be part of the new license agreement. As the meeting dragged deep into the night, Hansen never acknowledged that the record he was trying to correct was actually right to begin with, but he did help draft new voting rules he claimed to be against. And then the board unanimously approved the license agreement. By the time it’s over, everyone involved in working out a viewshed ordinance in Tuxedo park will wish they had never heard of it. Earlier this week the village held the first of what will be, I’m guessing, 183 public meetings on a proposal to restrict the size, type and location of new homes and additions that can be built in the Park, all with the intent of preserving the views of the hillsides and ridge lines from the Park’s lakes and roads. But a viewshed is both easy and impossible to define, an eye of the beholder kind of concept that fires up environmentalists almost as much as property owners (While there are relatively few viewshed ordinances in the world, it’s an old idea, and long since surpassed by commuteshed as the term tossed around by those seeking planning wonk street cred.). Tuxedo Park already has some of the toughest building standards around, but Glynn said they are not effective enough and he sees a day when the beauty of the Park, the sweeping views of the hillsides around Tuxedo lake, will be blotted out one shine McMansion at a time. here is where I must confess to a tenuous grasp of the details of the proposal. As this goes forward, I’ll post a lot more on that, including an electronic map of the viewshed districts, which i submitted a Freedom of Information request for today. Restricting colors and types of building equates to legislating out what makes Tuxedo Park great, said Trustee Chris Hansen. The language is vague and arbitrary,” said former Mayor David McFadden. This will depress property values, said Realtor Kathy Norris. What makes a viewshed ordinance so difficult to achieve is that it requires an entire community to agree on how to balance their economic interests with their desire to preserve the character of the community. To do that, they must first agree on what they believe the character should be. Then they have to decide how much it’s worth to them. The debates will get as specific as the number of trees to be planted in front of a house built on a hillside. Whatever there outcome, there will be some zero-sum winner and losers. If an ordinance is adopted, the homeowner with the vacant lot on the hillside has a less-valuable property, while the lakeside house with upward looking view is worth more. And, potentially, vice-versa with no ordinance. So, good luck. A lot more to come on this.